64 GB DDR3 ECC Registered Kit(PC3-1333, DDR3-1333MHz)- (8 x 8GB DIMMs) For Dell Poweredge T410, T610, R610, R710, R715, R810, R815, R915. Dell P/N A2626071, A2626092, A3721494, A3721500, A3721505. Major brand DIMMs manufactured by Hynix, Micron & Samsung. ECC Registered DIMMs & ECC UDIMMs can not be mixed. If your system came with ECC UDIMMs then use of registered DIMMs will require removal of all exisiting UDIMMs. Operational memory speed is controlled by CPU type and number of DIMMs installed. EFetcher's mission is to provide its customers a variety of computer products and excellent service at affordable prices. Over 24 years in business. Over 500,000 satisfied customers. 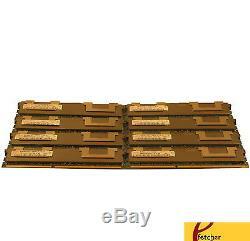 The item "64GB (8 x 8GB) MEMORY FOR DELL POWEREDGE T410 T610 R610 R710 R715 R810 R815 R915" is in sale since Monday, December 16, 2013. This item is in the category "Computers/Tablets & Networking\Computer Components & Parts\Memory (RAM)". The seller is "efetchercom" and is located in Lake Forest, California. This item can be shipped to North, South, or Latin America, all countries in Europe, all countries in continental Asia, Australia.